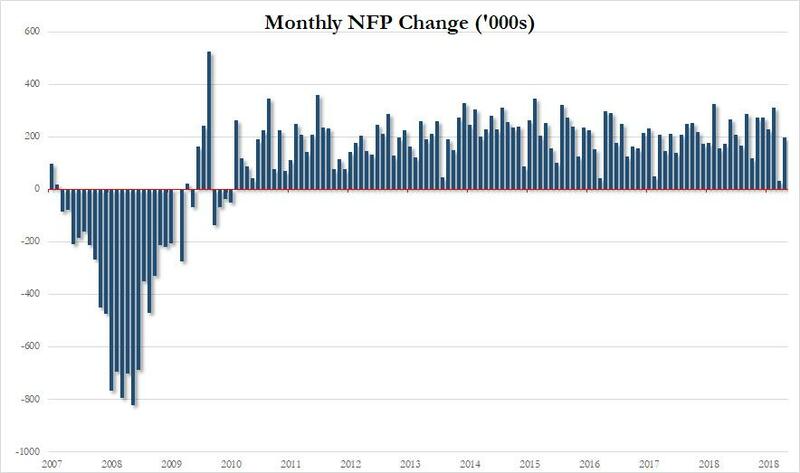 Expectations that the February cold weather"outlier" print would normalize in March were confirmed, when moments ago the BLS reported that the US added 196K payrolls in March, higher than the 177K expected, while February payrolls were revised modestly higher to 33K from 20K. The change in total nonfarm payroll employment for January was revised up from +311,000 to +312,000, and the change for February was revised up from +20,000 to +33,000. With these revisions, employment gains in January and February combined were 14,000 more than previously reported. Employment growth averaged 180,000 per month in the first quarter of 2019, compared with 223,000 per month in 2018. As we previewed earlier, winter weather was said to lower job growth in February by around 100k, much of which itself reflected payback from the relatively mild weather in December and January. Commenting on the March report, Bloomberg's economist Wliza Winger writes that "The March rebound in payrolls is consistent with previous episodes that followed much weaker-than-expected prints. Since the unemployment rate fell below 7% in late 2013, there have been five instances (not counting last month) in which the hiring rate dipped below 100,000. The average payroll print in the following month was 250,000, and there was only one instance where it was below 200,000." 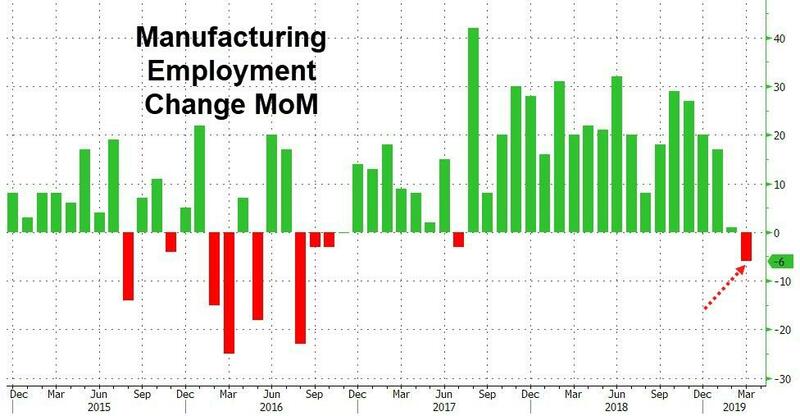 While the headline payrolls report coming in better than expected, and snapping back from February's cold weather, there was some unexpected weakness in manufacturing jobs, which dipped by 6K in March, their first drop since July 2017. There was more weakness in the Household Survey, where the number of employed workers declined by 201K from 156.949MM to 156.748MM, even as the ranks of unemployed shrank modestly from 6.235MM to 6.211MM. And while most were focused on the headline jobs print, which came in stronger than expected, the surprise this month was the average hourly earnings number, which came in far weaker than expected, rising just 0.1% in the month, far below the 0.3% expected, and a sharp drop from February's 0.4% increase while on an annual basis AHE rose 3.2%, also below the 3.4% expected and prior month print. That said, a big reason for last month's jump in earnings had to do with the decline in hours worked, which dipped to 34.4. 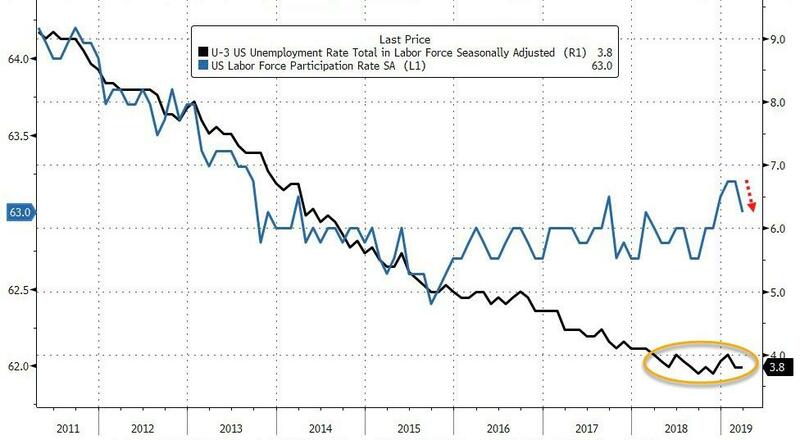 This number rose back to its recent normal of 34.5 in March, confirming that wage growth is once again becoming a problem for the Fed, and is the reason why both the dollar and bond yields dipped immediately after the report. Less eventful was the unemployment rate, which remained unchanged in March at 3.8%, just as expected. 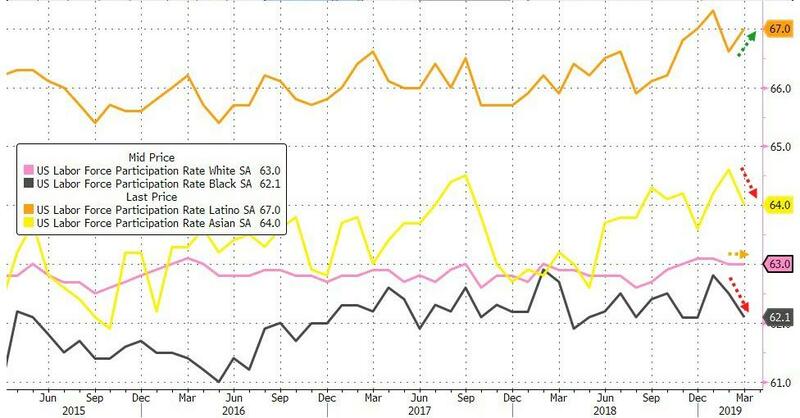 As Bloomberg notes, while unemployment rates by race and ethnicity show that most are still hovering at low levels, "something interesting is happening with black workers" who have seen a recent pop up in unemployment that has now been sustained for a few months. And while it initially seemed like the jobless increase might be driven by a pop-up in participation (i.e., people were just coming back from the sidelines and taking a minute to get hired), "the participation rate for 20+ black or African-American workers has now returned to where it was hovering late last year -- right around 62%." Putting it all together, Macro Research economist Neil Dutta notes that today's report means more of the same: "nothing in here to changed the Fed's view ... labor market still fine ... buy stocks. 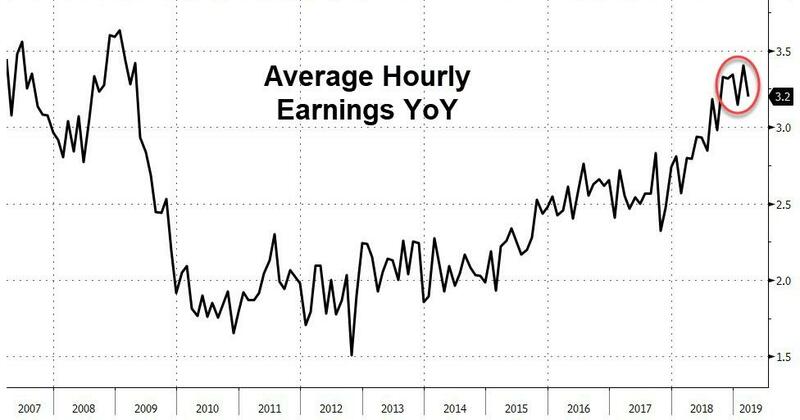 I like the 0.7% increase in aggregate weekly payrolls (higher hours offset slower earnings growth)." In summary, it looks like another "meh (or bad) news is good news" report, because while jobs came in "goldilocks", the weaker than expected hourly earnings pushed rate cuts odds slightly higher, which of course is positive for stocks, resulting in a spike in equity futures while bond prices rose as well, pushing the market "jaws" wider once again.